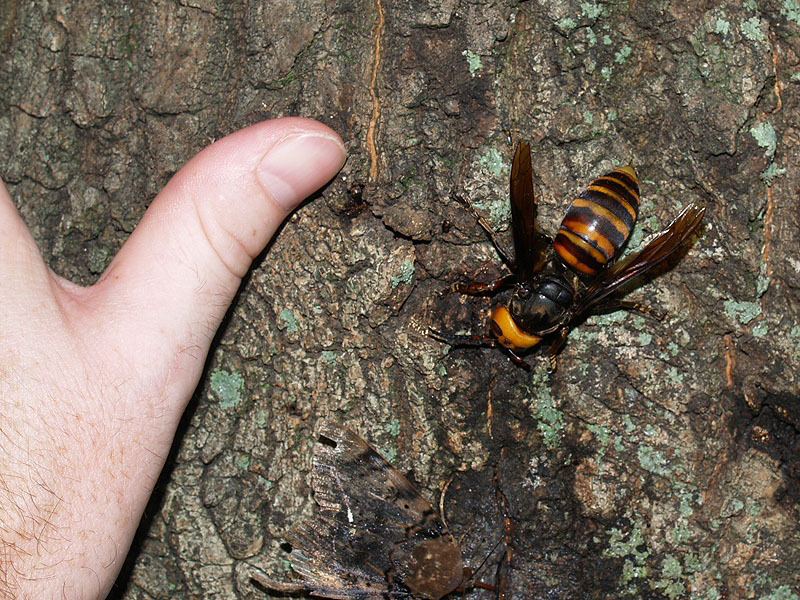 The Asian giant hornet, or as it is more commonly known in some cases the Japanese giant hornet, is a very large winged insect near the size of a thumb, with an average flight range of 1-2 km, and in the most extreme cases 8 km a day (Matsuura and Sakagami 1973). Additionally it appears that not only are the Vespa mandarinia capable of far distance flight, they are also capable of remembering pathways and landmarks, using them to navigate. They can use landmarks to guide their path to prior feeding areas or nests, even ignoring feeders placed directly by their nest to fly to one that they had been "trained" to use. They also controlled their altitude in response to how far they would have to fly, and before leaving would orient towards the feeder site, clearly showing some type of memory because they would do this irregardless of whether or not they could see the feeder site. What further helps in indicating some type of memory, is that each hornet would take an individual path, which may incorporate different landmarks and they will correct their path as they go. It also appears as if they can learn a new path if the feeder is removed, altering their paths after a couple of visits to get to the new feeder. More amazingly, even when they are impaired with antenna damage, they can navigate to the site, only being unable to even fly when part of their eyes were covered and vision was impaired, implying that chemical cues are not exclusively used to navigate to the food site. V. mandarinia was also found to navigate in the dark, perhaps using a combination of visual and chemical cues, combined with its path memory (Toh and Okamura 2003). They are the largest of the Vespa family; with a “deeply incised clypeus and enormously developed genae” further separating its body plan from the other members of the family Vespa. The V. mandarinia, like all insects, are composed of three body parts, six legs, and is covered in a chitinous exoskeleton. Its massive size also means it has a massive stinger, with very dangerous venom that can cause severe damage to anything afflicted by it, as seen on the venom page. The exoskeleton is also of particular note, as it is nearly impervious to bee stings which Japanese honey bees have developed a unique defense to, and which European honey bees have not. The clypeus is the section on an insects face below the eyes and above the mandibles, a hard part visibly separate from the rest of the face, while the genae are the “cheeks” of an insect, lying on either side of the head, and supporting its powerful mandibles. The genae size factors into the head size, which in addition to weight, eye width, and head width allows it to outclass other members of the family, with the nearest specimen, V. tropica, weighing in at .42 grams less than V. mandarinia, which is a sizable 1.60 grams (Matsuura and Sakagami 1973). The queens can grow even larger, specifically when new queens are preparing to leave a nest; this results in a weight change from 2.9 grams to 3.5 grams. They build primarily subterranean nests in hollows or prior rodent dwellings, and live there for the entire nesting season. As for feeding, the V. mandarinia can eat sap or they can prey upon insects that are not agile enough to escape their large forms, such as caterpillars and spiders. 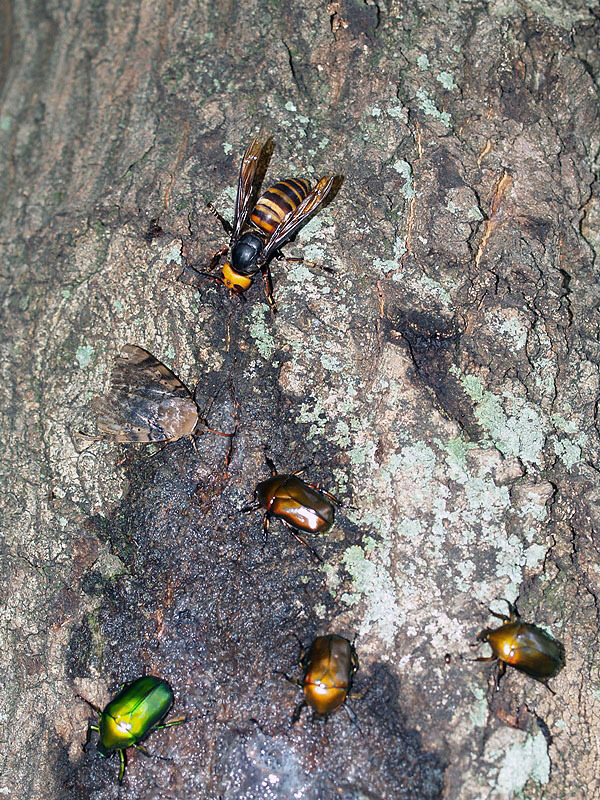 Another more extreme method of finding food is when a group of up to 50 giant hornets attack in a coordinated fashion on a bee nest, or even another wasp nest, seen here, which is considered to be possible chemical signal activation via a scout hornet that allows its fellows to find it and join the attack (Toh and Okamura 2003). The attack occurs in three phases: hunting, slaughter, and occupation. This attack can stretch across days or it can last a mere matter of hours, and by the end the colonies inhabitants are dead or have ran away, leaving the larvae and pupae ripe for the taking, which the giant hornets take back to their nest. They will also gather up “meat balls” of mesosomas and take them back to the nest for later consumption by the young. Generally for these nest attacks they will stay within their 1-2 km average for nest distance (Matsuura and Sakagami 1973). When going into sap feeding patches, V. mandarinia is shown to defeat all other sap feeding species a majority of the time, should fights occur. 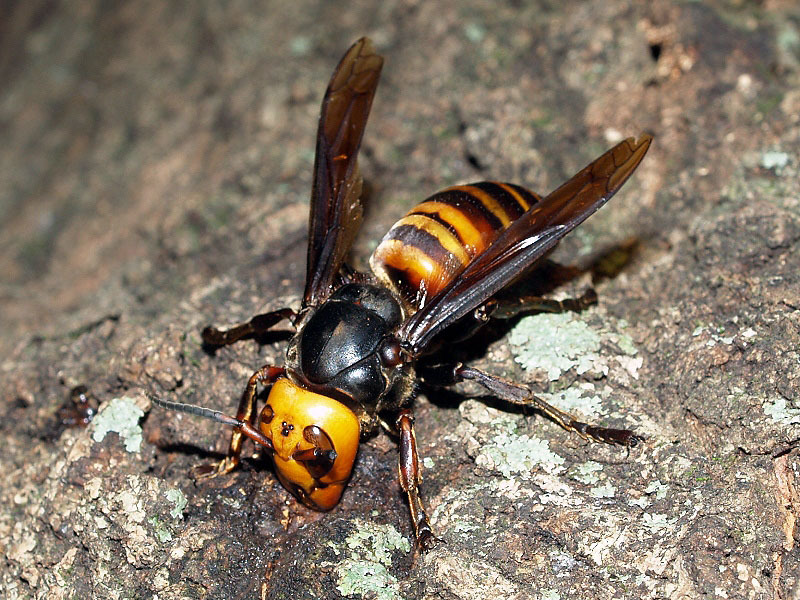 The giant hornets will even warn off butterflies and other Vespa should it want the patch to itself through sheer threat of its intimidating presence. The butterflies are always unwilling to fight but will often fly to the patch without realizing the danger, the exact opposite reaction of other members of the Vespa. As it is the world’s largest hornet and is also additionally very aggressive, this means that it generally has a patch under its control, with a 98% victory rate in the event of fights. However it also seems as if visual avoidance cues may also play a role in sap interactions among Vespa, preventing possible conflicts in certain cases (Yoshimoto and Nishida 2009).